Oundle celebrate their Burghlay Park sixes success. Photo: James Biggs. Oundle Town, playing in the Burghley Park sixes for just the second time, were crowned champions tonight (July 7). After two thrilling semi-finals to whet the appetite of what must annually be the biggest crowd to watch a local cricket event, the final was disappointingly one-sided as Oundle despatched the entire Bourne side for just 39 before romping to victory with half their overs to spare. A glorious feast of cricket on this most picturesque of grounds was followed by some thin gruel. Harrison Craig was in superb form for Oundle on finals night at the Burghley Park sixes. Still Oundle won’t mind that. They were clinical, and indeed quite brilliant, in the field in the final, starting with Hanno Kotze’s superb catch first ball of the innings to dismiss dangerous Jack Berry and climaxing with a 40-yard shy at the stumps from Pete Foster which ran out Quewin O’Connor at a time when Bourne were operating under the rarely-employed rule, outside of a kids’ game in the park, of ‘last man stands’. 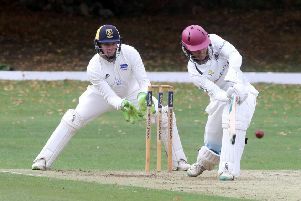 Harrison Craig also bowled Sam Evison in the opening over to leave Bourne at 4-2 and then executed a superb run out as well as taking a catch on the boundary. It wasn’t a bad night for the younger of the gifted Craig siblings. In the semi-final against Nassington he looked certain to be over-shadowed by big brother Conor Craig who claimed three wickets in an over for the holders - after Kotze had hit the first ball somewhere close to the A1 - but Harrison strode to the crease with 12 needed from four balls and promptly hit Dan Bandaranaike for three successive boundaries. Harrison was later presented with the player-of-the-week trophy, an accolade won by Conor last year. Bourne played their get out of jail free card in their semi-final against Castor. Berry’s horror of a penultimate over left Castor requiring just 10 from the final six balls with awesome Aussie Joe Higgins facing on 42 not out. A wide (it’s worth four in sixes cricket) left Castor requiring two from three balls, but Tom Dixon held his nerve to concede a single to Higgins before bowling a dot ball to last man Cameron Dockerill. Dockerill needed to to score two from the final ball to see Castor home, but instead chipped the ball straight to Rob Dunn at long off. Bourne’s night went quickly downhill from there. NASSINGTON 70-4 (T. Norman 22) lost to OUNDLE 72-4 (H, Kotze 26, C. Craig 3-10). BOURNE 70-2 (S. Evison 37no, T, Dixon 22) beat CASTOR 69-5 (J. Higgins 48no).